We are so grateful to all of our wonderful supporters who help us raise awareness of pancreatic cancer in their workplace. However, with cancer being responsible for 29% of long term absence at work, the importance of getting people in the workplace, and their employers, involved in learning about cancer is more important than ever. According to Cancer Research UK, there were around 357,000 new cases of cancer in the UK in 2014[i] (that’s 980 cases diagnosed every day). 100,000 of those diagnosed with cancer every year are of working age[ii] and currently, there are over 700,000 people of working age living with a cancer diagnosis. [iii] This demonstrates how important it is for employers to be aware of cancer and how it can affect their employees. In particular, pancreatic cancer needs to be highlighted more in the workplace. 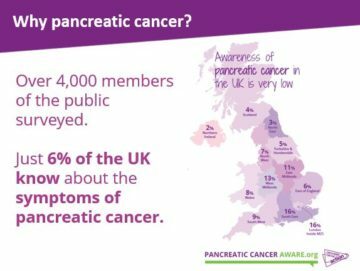 A recent survey commissioned by Pancreatic Cancer Action shows that, although almost 10,000 people are newly diagnosed with pancreatic cancer each year in the UK, only 6% of people in the UK know a lot about pancreatic cancer. Raising awareness of the signs and symptoms of pancreatic cancer is key to improving the survival rate because if diagnosed early, chances of survival improve significantly. Why raise awareness in the workplace? The Cancer in the Workplace 2016 report, commissioned by Check4Cancer, set out to explore how employers are responding to the increase of cancer diagnoses, the plans being made, changes being introduced and views on the readiness of their organisation. The report showed that 64% of HR managers say that cancer is an issue currently affecting people in their organisation, however, it also highlighted the real lack of planning for employee support around cancer, despite the growing awareness of the need to attract and retain the best staff. A shocking 71% don’t have any policies in place for communicating with employees about cancer (this figure rose to 89% in smaller firms) and nearly half of HR managers think line managers are unprepared when it comes to managing employees with cancer. A cancer diagnosis can have a real effect on the whole organisation and present challenges to management in particular. It is important that companies are prepared, not only when it comes to support, but also with managing cancer awareness and effective communication with staff in the workplace. The Check4Cancer report highlights how employers chose to face this issue is likely to prove essential to corporate health in years to come. With the low survival rate of pancreatic cancer and more people diagnosed each year, it is crucial that awareness of its signs and symptoms is a point of focus when it comes to cancer awareness. 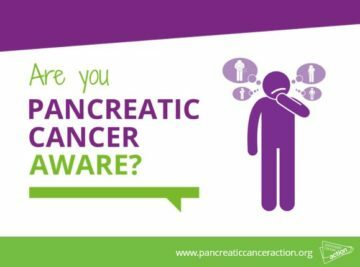 Our Occupational Health and Wellbeing campaign aims to tackle some of these issues by going into the workplace and talking to people directly about pancreatic cancer. This year we went into seven different work places to pilot the campaign and see if there was interest. 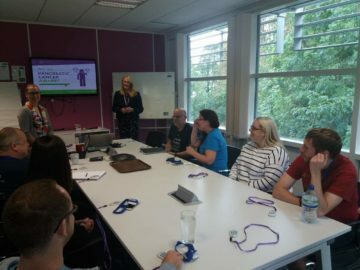 Ali Stunt, CEO and founder of Pancreatic Cancer Action, spoke to groups of six people up to groups of 70 in Manchester, London, Cheltenham, Leatherhead and Warrington. Why is it important to focus on cancer in the workplace? What is cancer and what is pancreatic cancer? The issues surrounding pancreatic cancer in the UK – why are survival rates so low? Due to the success of the pilot and receiving fantastic feedback we are pleased to announce that we will roll out the campaign in 2018. So, if you would like Ali to come and speak in your workplace, perhaps as part of a wider well-being initiative, then please do get in touch. E-mail [email protected] or ring 0303 040 1770. [ii] Office for National Statistics. Registrations of cancer diagnosed in 2003. Cancer statistics registrations. England. 2005.